Tom Kerridge brings food and music to Chiswick with Pub in the Park, the Design Museum celebrates the best Designs of the Year and Hozier performs at the London Palladium; these are the best London events in September 2019. Month-long event Totally Thames returns this September with river-related events taking place along the river's entire 42-mile course. 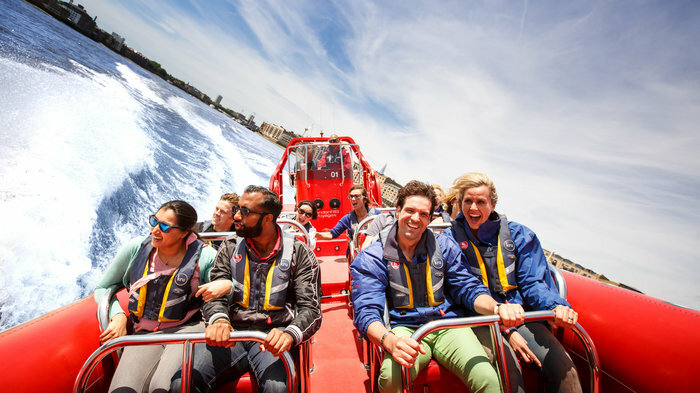 Month-long event Totally Thames returns this September with river-related events taking place along the river's entire 42-mile course through the capital. The festival - much of which is free - celebrates the main waterway which winds its way through the heart of the city, through a diverse mix of art, music, and educational events both on the water and along its banks and bridges at various riverside locations from Westminster Bridge to Tower Bridge and beyond. This year, the event explores unusual and untold stories connected to the River Thames and aims to raise awareness of plastic pollution. Tom Kerridge brings food and music to the picturesque gardens of the west London stately home. New for summer 2019, Tom Kerridge brings his Pub in the Park festival to Chiswick House for the first time, delivering food and music to the picturesque gardens of the west London stately home. Kerridge, chef-owner of the only pub in the UK with two Michelin stars, has lined up some first class pop-uppubs and restaurants for Chiswick including his own The Hand & Flowers, The Star Inn, Claude Bosi'sOyster Bar at Bibendum, Jose Pizarro, Rick Stein's Barnes restaurant, Berners Tavern, The Pony & Trap, Heston Blumenthal's The Hinds Head in Bray and Cafe Murano. The live music line up lists Gabrielle, Clean Bandit, Stereo MCs, Texas, Soul II Soul Sound System, Scouting for Girls, Toploader and local singer Sophie Ellis-Bextor as well as Natalie Williams and the Soul Family. Mixing chef demonstrations, top quality food and live music,it's the best of the pub brought out into the open air. Sell out concert bringing the famous classical music festival to a rousing close. The grand finale to the annual feast of classical music. The Last Night of the Proms, which brings the festival to a rousing close, traditionally features patriotic tunes like Arne's Rule, Britannia!, 'Land Of Hope And Glory', Jerusalem and The National Anthem. Tickets are almost as hard to come by as Centre Court passes for the Wimbledon finals, but like the tennis, the whole thing is broadcast live on the BBC - and all round the world. Plus, on the same night, there's the popular Proms in the Park party in nearby Hyde Park. Britain's largest open air classical music concert comes to an explosive end. The world's only mindful triathlon with a number of accompanying activities. Producers of the largest yoga lifestyle events in the world, Wanderlust presents the world's only mindful triathlon this September. Returning to Battersea Park in 2019, Wanderlust 108 involves a 5km run (or walk), an outdoor 90-minute yoga class and a guided meditation. There will also be free scheduled aerial yoga, acro-yoga, hooping and walking meditation classes as well as live music and DJs, artisanal vendors selling everything from clothing to jewellery, local food and plenty of further activities. The line-up includes Katarina Rayburn, Ida May, Light Watkins, Will Sebastian and Kimberly Parsons. An annual celebration of the most original and exciting products, concepts and designers in the world. The Oscars of the design world, the Design Museum's Beazley Designs of the Year is an annual celebration of the most original and exciting products, concepts and designers in the world and the shortlisted entries go on display at the Design Museum. Close to 90 nominations are typically made across six categories - fashion, architecture, digital, transport, product and graphic design - from innovative designers from around the world. Last year, the fashion category included items from Nike's Nigeria National Football Team kit while Elon Musk's most powerful rocket was among the top designs in transport. Nominations also included electronic self-healing skin, the Louvre Abu Dhabi, Burberry's rainbow check and Royal Ballet costumes designed by Erdem. A new comedy from the team behind The Play That Goes Wrong. A new play from Mischief Theatre, the creators of The Play That Goes Wrong, Groan Ups is a show all about growing up. The brand-new comedy questions whether we're the same people at 30 as we were when we were 13 by throwing a number of grown-up problems at an unruly classroom of kids and anarchic high school teenagers. The new production premieres at the Vaudeville Theatre this September. The examines what it means to have a body in this new exhibition. Well known for using his own form as a recurring feature in his works, Angel of the North sculptor Antony Gormley examines what it means to have a body in the Royal Academy of Arts' major autumn exhibition. The solo show, the most significant in the UK for over a decade, brings together existing and new works created especially for the occasion. Drawings and sculptures, expansive and immersive installations take over the RA's main galleries, filling them with iron, steel, lead, seawater and clay artworks which put the solidity and certainty of sculpture to the test. The Philharmonia Orchestra performs John Williams' well known score for five shows only. The Empire Strikes Back as Star Wars in concert takes audiences at the Royal Albert Hall to another galaxy, far, far away, with the Philharmonia Orchestra performing John Williams' well known score for five shows only this September. It follows Star Wars: A New Hope in concert, shown here last year, and picks up the story as the battle for the galaxy intensifies and Han Solo (Harrison Ford) and Princess Leia (Carrie Fisher) flee to Cloud City where they are captured by Darth Vader. It's up to Luke Skywalker to save them. Introducing the Imperial March and Yoda's Theme, new music broadens Han and Leia's theme and develops the soundtrack to enhance the film. A rare chance to see inside London's architectural landmarks. An immersive journey into the fantastical worlds created by photographer Tim Walker. Revealing the important roles played by set designers, stylists, make-up artists, models and muses, this Victoria and Albert Museum exhibition gives you a behind-the-scenes insight into the creative process behind Walker's imaginative images. At the heart of the exhibition are new photographs directly influenced by Tim's research into the V&A's collection - a source of inspiration over the past 25 years. A fascination look at the creative process of one of the world's most inventive photographers. One of London's biggest and best dog shows with 18 classes and celebrity judges. One of the biggest and certainly the best dog shows in London town, the Chiswick House Dog Show is a fun day out even if you don't have a four legged friend. With celebrity judges - David Tennant, Mel Giedroyc, Wayne Sleep and Ant and Dec have all judged in the past - and 18 classes to enter, there's always something to see and it's fun seeing whether you agree with the judges' on who's the best dressed or which pooch really does have talent. Good old fashioned games - like the human fruit machine - create the feeling of a village fair and there are over 40 stands selling everything from dog beds to country coats. Food and drink stalls get busy but you can always bring your own picnic, set the rug down and make a day of it. The fancy dress competition - given a different theme each year - sparks some wonderfully creative ideas from cops and robbers to 'The Canine Cannonballs' which scooped last year's prize following a circus theme. The survival expert recreates his Everest challenge and shows how to build psychological resilience. The adventurer, survival expert and TV presenter, who came to fame on Channel 4's SAS: Who Dares Wins, recreates his recent Everest challenge through lighting, sound and set. Proving that it's Mind Over Muscle that counts, Ant Middleton takes you on a motivational journey of self-help and self-discovery, showing the mental strength it took for him to overcome huge challenges. His latest Channel 4 series sees Ant lead a group of 25 high into the spectacular and punishing Andes Mountains in Central Chile. He draws on Special Forces experience and training with the UK's Elite Forces (P Company, Commando Course, UK Special Forces Selection) to pass on his tips for survival, psychological resilience and physical endurance. Marching bands, Morris dancers, maypole dancing and the mayors of London. Each year, on a Sunday in September, London's Pearly Kings & Queens come together to welcome the new season in style - and boy what a style they have, with extravagant Smother Suits covered top to toe in sparkly buttons, badges and glitter. The free festival starts in the afternoon at Guildhall Yard with marching bands, Morris dancers, maypole dancing and the mayors of London. No doubt the celebrations continue with some pints of ale and plates of jellied eel at an East End boozer - perhaps interspersed with a spot of Morris dancing. It's a wonderful spectacle but one that helps raise money for charity. A second Pearly Kings & Queens Harvest Festival is held in October in Covent Garden, at St Paul's Church. The Irish singer stops by the London Palladium for five nights. The soul and blues-folk singer from the Dublin first found fame with the release of his globally successful, triple platinum single Take Me To Church, the video for which has been viewed over 250 million times on YouTube. Now Hozier releases a new album, Wasteland, Baby!, and stops by the London Palladium for five nights as part of his UK & European tour. Winner of a coveted Ivor Novello, creator of stunning sets at Glastonbury and Longitude and an unforgettable duet with Annie Lennox at the 2015 Grammy Awards, Hozier creates hauntingly beautiful music. From cheap budget accommodation to luxury 5 star suites see our discounts for hotels, including The Stafford London Hotel from 62% off.